Nathan Paramanathan’s works have featured in many exhibitions in Australia and are included in public and private collections. Born in Malaysia in 1929, Nathan Paramanathan came to Australia in 1949. 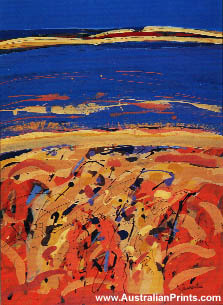 His painting training began at Melbourne’s Institute of Technology, having been granted a painting fellowship in 1965. Nathan has long experience in art education. He taught at the Phillip Institute of Technology from 1964, becoming Art Education Department head in 1975. 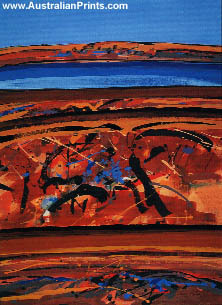 Since leaving PIT in 1987, Nathan has been able to devote more time to painting which is based on enjoyment of the Australian landscape. The areas he has represented include the Wilcannia Plains, the ruggedness of Mt Buffalo, the watery expanses of the Coorong, the vast red terrains of Western Australia and the unique wilderness of Kakadu. Nathan works with oil on canvas or board, but more frequently incorporates acrylics, watercolour and ink on paper to produce an innovative approach to landscape painting. He abstracts colour and light in fluid expressionistic works. His works have featured in many exhibitions in Victoria and are included in collections, both public and private. Artist information page for Nathan Paramanathan.